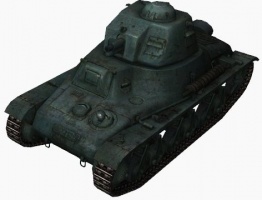 The Hotchkiss H35 is a French tier 2 light tank. Cavalry support tank. Developed in 1934. Mass production was launched in 1935, with a total of 400 vehicles manufactured. In 1938 a new modification, the H38, entered production. About 1000 of the H35/H38/H39 vehicles were produced. In a tier filled with fast and agile tanks, the H35, along with its German premium counterpart the Pz.Kpfw. 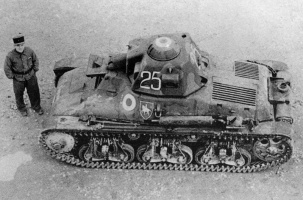 38H 735 (f) and the other French Tier 2 tank, the D1, stands out with its exceptionally thick armor and relatively low mobility. It is particularly well-suited to leading assaults or locking down avenues of approach, especially with the support of the team. 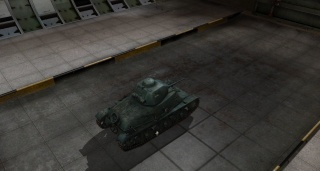 This tank, while slow as mentioned, can act as a heavy when top tier. Its 25mm Rascucci has an incredible RoF able to rival the Matilda. But dont be fooled. The damage is low but acceptable for a tier 2. Make sure to keep your turret somewhat angled and avoid shooting tracks, due to the bad multi-layer penetration on armored targets. The shortest route is almost always preferable to a longer travel. You'll soon find this rolling machine gun to be an unstoppable force against the enemy team. The Hotchkiss H35 leads to the Somua S35. 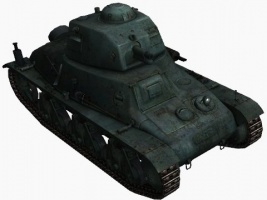 The Hotchkiss H35 plays more like a medium or heavy tank than a light tank. Right off the bat, one will notice that it is fairly slow and clumsy in handling. 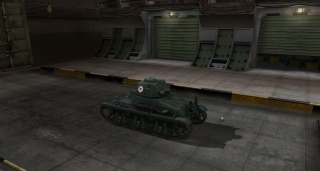 It is not incredibly slow, but it is rather sluggish when compared to all the other light tanks. While other tanks of its tier can easily run down trees, trucks, barricades, and other obstacles in their way, the H35 has neither the mass or momentum. When driving the H35, it is best to avoid these obstacles and not try to run them down, lest they slow it down even further. The H35 receives the same stock gun as the Renault FT, the 37 mm APX SA18. While workable at Tier 1, the SA18 is simply not good enough for Tier 2 or Tier 3 matches, with horrible accuracy, lousy penetration and damage. The 37 mm SA38 is a significant improvement in accuracy and damage, with somewhat more penetration. Curiously, what is essentially the same gun on the Pz.Kpfw. 38H 735 (f) has somewhat more penetration than the SA38 on the H35. It is also a lot more accurate, aims faster, and reloads faster on the German premium tank. The 25 mm Canon Raccourci Mle. 1934 is probably the best choice, given its higher penetration, accuracy, and rate-of-fire, with only slightly less damage. Unfortunately, it has a maximum effective range of 395 m, beyond which it cannot penetrate even the lightest of armor. It also does not have a HE round and has significantly worse gun depression than the SA38 and SA18. The H35 is very well-armored. 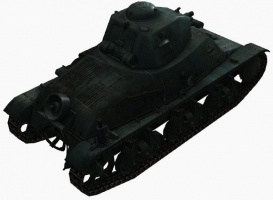 It has some nice sloping on the front, sides, and rear, as well as a good 40 mm thickness for all its sides (which generally means if an enemy cannot penetrate it from the front, he will have an equally hard time with the sides and rear). Shots that do penetrate, however, are extremely dangerous to the tank. It can be wiped out by two or three shots from a tank destroyer, or can be mowed down by multiple lighter tanks that can out maneuver it. There are also several prominent weakspots in the form of the commander's and driver's vision ports, through which most low-tier guns can penetrate. The H35 benefits immensely from angling, sidescraping, and a general knowledge of how to hide its weakspots. These skills can dramatically improve its survivability, and make it a formidable opponent in urban maps. Repair as the first skill for all the crew members is a solid choice for the H35, allowing broken tracks or other damaged modules to be brought to operational condition as quickly as possible. Camouflage is also a viable option, since the H35 does have fairly good camouflage values. A more specialized set of first skills would be Snap Shot (Commander/Gunner/Radio Operator/Loader) and Smooth Ride (Driver). The combination of Snap Shot and Smooth Ride act like a Vertical Stabilizer (which the H35 does not have access to), reducing the accuracy penalties while moving or turning the turret, and by extension, allowing the H35 to get an accurate shot off faster after stopping. Mentor may also be used instead of Snap Shot if the emphasis is on getting the other crew member's skills up faster. Off-Road Driving or Clutch Braking are also viable instead of Smooth Ride for increased mobility or close-combat capability, respectively. Upon reaching 100% on the first skills, dropping the commander's skill for Sixth Sense is a good option. Brothers-in-Arms is a good perk to have on any tank, but requires all crew members to have it at 100% before it works. The bonus to crew skills is particularly noticeable when combined with Improved Ventilation. The only thing that carries over from the Renault FT is the 25 mm Canon Raccourci Mle. 1934 gun. Mount it immediately. The stock H35 suspension can take all the upgraded modules, but cannot mount much equipment. Researching and mounting the upgraded H35b suspension allows more equipment to be fitted and also provides a small increase in hull traverse speed. The 37 mm SA38 is required to unlock the Somua S35. However, if there is no intention to use it, it can be saved for last. The Renault V4 engine provides a welcome increase in mobility to the sluggish H35. The ER 53 radio is not essential, but it is used on a wide variety of French tanks, so researching it early on in the H35 is a good idea. 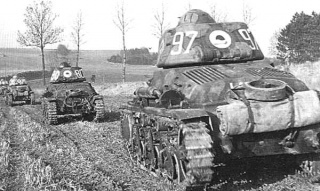 In 1926, the French Infanterie decided to provide armour support to the regular infantry divisions by creating autonomous tank battalions equipped with a light and cheap infantry tank, a char d'accompagnement. For this role at first the Renault Char D1 was developed, but it proved to be neither particularly light nor cheap. In 1933, the company Hotchkiss et Cie, under its own initiative, presented a plan to produce a lighter design through the application of new manufacturing techniques to produce cast steel sections to construct an entire hull. Hotchkiss et Cie was a French arms manufacturer established by American gunsmith Benjamin B. Hotchkiss, who had learned his trade at Colt and Winchester in Connecticut. Hotchkiss moved to France in 1867 and set up his own gun factory at Viviez near Rodez. In 1875 he moved it to Saint-Denis near Paris. On 30 June 1933, the Hotchkiss proposal was approved by the Conseil Consultatif de l'Armement. 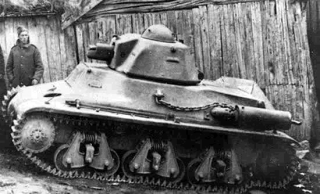 On 2 August 1933 the new tank's specifications were made known: a weight of six tonnes and 30 mm armor thickness all around. Three prototypes were ordered from Hotchkiss, but the entire French industry was also invited to provide alternative proposals. This allowed the Renault company to beat Hotchkiss in delivering their first prototype, which was later developed into the Renault R35. On 18 January 1935, the first Hotchkiss prototype, not yet made of armor plating, was presented to the Commission d'Expérience du Matériel Automobile (CEMA) at Vincennes; it was a turretless machine gun-armed tankette. It was tested until 4 March 1935, when it was replaced by a second identical prototype to be tested until 6 May. Both had to be rejected because new specifications had been made on 21 June 1934 that increased the desired armor thickness to 40 mm. On 27 June 1935, the commission approved the type on the provision that the necessary changes were made. 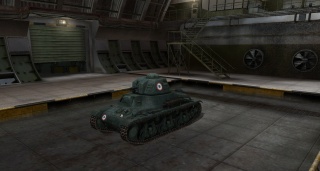 On 19 August, a third prototype was delivered, equipped with a cast APX turret and featuring a redesigned hull; it was tested until 20 September and accepted for service as the Char léger modèle 1935 H. On 6 November, a first order was made for 200 vehicles. The first production vehicle was delivered on 12 September 1936. That same year, two additional orders had already been made of 92 and 108 vehicles respectively. By 1 January 1937, 132 vehicles had been produced. The first series production vehicle was again extensively and intensively tested until 4 December 1936. This showed that its handling qualities on rough terrain were unacceptably poor. It was simply impossible to safely steer the vehicle on a somewhat rough surface, posing an extreme danger to nearby friendly infantry. The Infanterie therefore decided to accept only the first 100 tanks to equip just two battalions with the type: the 13e and 38e Bataillon de Chars de Combat and reject any further procurement. 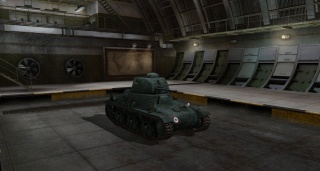 For political reasons, however, stopping production of the tank was not acceptable. And so the other 300 vehicles of the production run were offered to the Cavalerie, which was forced to accept them because it would not have been granted a budget for other tanks anyway. As the cavalry units would be making more use of the road network and of mounted infantry, its cross-country handling problems were of less consequence. The H35 was, at 28 km/h, also somewhat faster than the Renault R35, which was capable of 20 km/h, although in practice its average speed was lower than that of the R35 because of its inferior gear box. 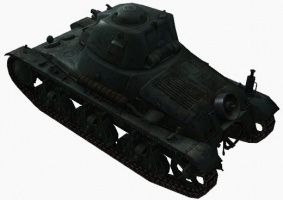 The H35 was a rather compact tank, being 4.22 m long, 1.95 m wide and 2.15 m tall, and weighing around 11 metric tons. The armor was made completely of cast steel in six parts that were bolted together. The armor was also well sloped to increase the chance of deflection and the tank was equipped with a six cylinder 78hp engine. The crew consisted of only two members, the driver and the commander who had to take the duties of Radioman, Gunner and Loader as well. The driver did not have it any easier as the vehicle was difficult to drive as the gearbox and brakes were weak and prone to malfunction. The tank was initially equipped with the short 37mm SA18 gun that had only 23 mm of armor penetration, too light to even pierce the H35's own armor and completely inadequate in the anti-tank role. In 1939, an upgraded variant with a 120 hp engine, an improved suspension and tracks and, eventually in 1940, an improved 37 mm SA38 gun was produced as the Char léger modèle 1935 H modifié 39 or H39. The poor cross-country performance of the original model led to the intended users of the H35, the infantry, rejecting it. This led to the cavalry regiments receiving the original batch of tanks and requesting the increased speed that the H39 variant eventually delivered. 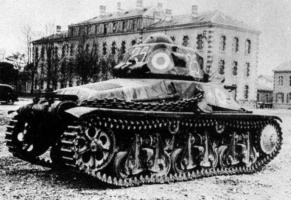 By the beginning of the Second World War, 640 Hotchkiss tanks of various variants were delivered to various arms of the the French army. 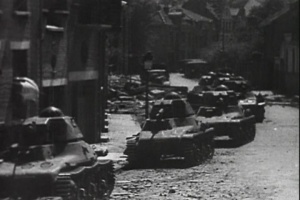 The Hotchkiss tanks proved themselves during the battle of Flavion and, most notably, during battle of Stonne (also known as the "Verdun of 1940") in which they, along with Char B1 heavy tanks, permitted outnumbered French forces to resist the German assault for three days, inflicting heavy losses. The Germans captured 550 of them after the fall of France. Most of these units were used for policing and training roles, though some saw action in Yugoslavia and during the Normandy Campaign. Some H39s were also used as a conversion base for the Marder I tank destroyer. Bingham, J., 1971, AFV Weapons Profile 36 - Chars Hotchkiss, H35, H39, and Somua 35, Profile, Windsor, UK, 24p. 1935 CHAR HOTCHKISS H35 at chars-francais.net Photos, specs, and brief history in French. This page was last modified on 9 January 2018, at 00:45. This page has been accessed 12,293 times.